On this 8-day trip through the Azores, you will explore the ancient world of volcanoes on foot. Track the origins of São Miguel, Pico and Faial Islands to experience thermal springs and nature at its finest. This experience will take you to explore some of the best trails in the Azores, such as the rim of the volcanic complex of Sete Cidades or the Pico Island vineyards, classified as a world heritage site by UNESCO. If you love hiking and adventure, this trip is for you! Welcome to Azores! When you arrive, you will be transferred to your hotel, check-in, and enjoy a welcome breakfast. Your rooms are booked to guarantee that you can use them upon arrival to rest. You will meet your local guide in the hotel lobby at 12:00pm. Lunch at the city centre at Anfiteatro – a seaside restaurant run by the local Hotel Management School. 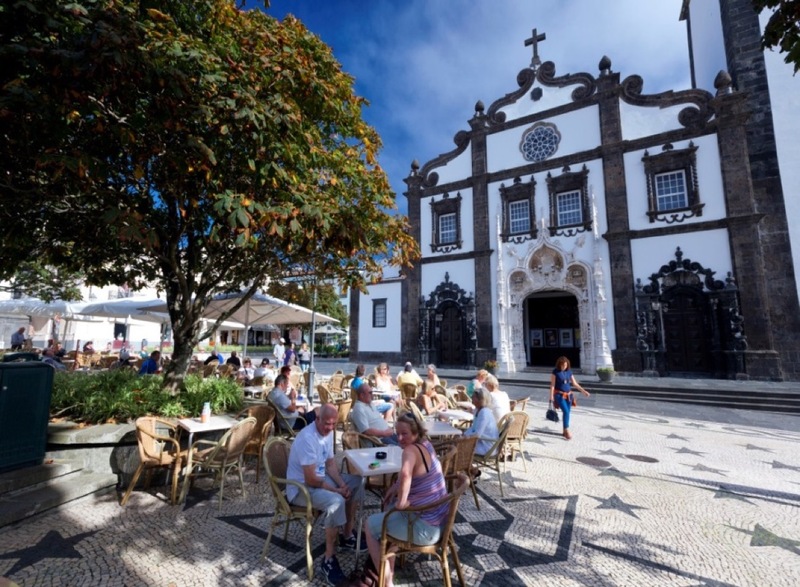 After lunch we will embark on a short walk through the Ponta Delgada City centre to discover more about the Azorean capital. In the evening we will meet at the hotel lobby at 7.00pm for an information session and welcome drink. We will cover topics including: guide introductions, itineraries, scheduling, meals, weather forecasts, equipment, program changes/adjustments (if needed), flight schedules, transfers, hotels, and tips on local life. We will have dinner at the hotel. A diverse selection of tasty starters and main dishes will be brought to the table for a traditional ‘family-style’ meal. 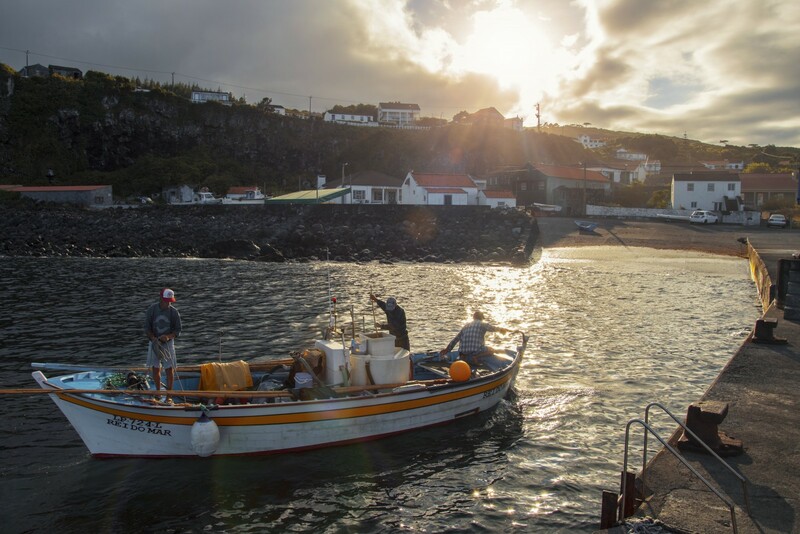 Let’s explore the West side of São Miguel! Sete Cidades lake is one of the most famous and legendary lakes of the island. During the 11 km long hike today (approx. 4 hours) you will have the opportunity to learn about the fauna, flora, history, volcanic formation of the island, and of course, you will hear the legendary love story behind the formation of the lake. A typical Azorean picnic lunch will be served on the lake shore. After the walk we will drive along the south coast and stop in Ferraria. Upon arrival, you’ll be able to swim in the oceanic pools heated by the surrounding volcanic vents – a wonderful opportunity to relax after your flight! We will then transfer you back to the hotel and give you some time to rest before dinner. Dinner will be served in a traditional restaurant that will take you back to years gone by. You’ll taste a classic recipe of beef stew seasoned with spices from India that were originally brought to the Azores during the first settlements on the islands. This morning, transfer from the hotel to Ponta Delgada airport and depart to Faial Island. On Faial Island you will embark on a 7km hike (approx. 3 hours). Drive by jeep or van towards Caldeira, a large volcanic crater with beautiful views over the sea and Pico Island. Short drive to Capelinhos Volcano and its surrounding area. The endemic vegetation is amazingly well preserved and it’s a constant during the trip. Upon arrival to the area affected by the eruption, we will visit the volcano’s interpretation centre. Along with your local guide, you will climb to the top of the lighthouse, from where we will have an expansive view over all the newly formed sections of the island which were created by the last eruption in 1957. The views over the black volcanic rocks and sand are extremely beautiful, contrasting with the deep blue of the ocean. After the visit we will have our lunch. In the afternoon we continue our tour in Horta city and visit the famous Marina and Peter’s Café. Transfer by boat to Pico Island (20 mins) and transfer to your hotel. The evening dinner is at a restaurant in Madalena where you will taste local delicious seafood. 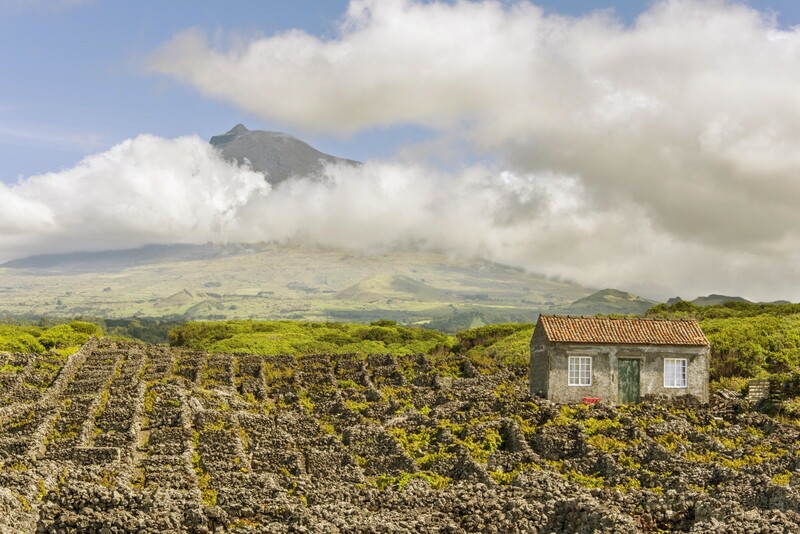 Today’s 10.5km hike (approx 3.5 hours) takes place in Santa Luzia and will take you through some of Pico’s UNESCO World Heritage designated vineyards. Along the hike, you will notice some marks of the traditional horse wagons that were used to transport the wine that was produced there, as well as some interesting geological phenomena. The visit to a local alembic and the Wine Museum complete the day. Tonight we will drive to São Roque where we will have the chance to visit a traditional winery with local wine production; “Verdelho do Pico” (“Adega A Buraca”). An amazing traditional meal and wines will be waiting for you to dig in! Today we will be hiking in Caminho dos Burros for 11.2km (approx. 4.5 hours). The trail starts in Pico’s “Planalto Central” area (Pico’s Central Plateau) and continues slightly downhill as we hike from the south to the north of the island. The endemic vegetation is present throughout the walk, featuring impressively sized specimens. Reaching Praínha’s Forest Park we will have a break for our picnic lunch and also some free time to visit the park. Continuing the hike, we continue our decline until we reach “Baía das Canas” in the coast where the trail ends. Possibility of swimming in a natural bay. Tonight, enjoy a Barbeque at the hotel. This morning, you will transfer to the airport and depart back to Ponta Delgada. When you arrive, enjoy lunch at a local restaurant. Today we will be going on a whale and dolphin watching trip! During this activity you will have the opportunity to watch some of more than 25 cetacean species that can be found in the Azores. 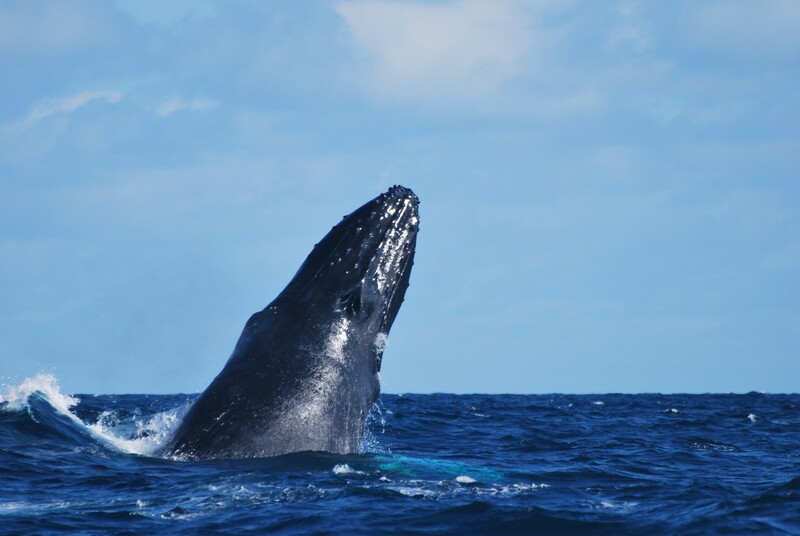 Although nature offers no guarantees, whales and dolphins are regularly seen during our half day tours, along with turtles, seabirds and other marine life. Before the boat trip our biologists give you a briefing to explain which cetacean species can be observed, safety measures aboard, how we respect the animals and rules of observation at sea as well as some historical facts. During the tour each passenger is required to wear a life vest (except on our catamaran). We also provide rain coats and trousers if necessary. After the boat trip, you will be picked up at the marina and transfer to Lagoa do Fogo viewpoint. 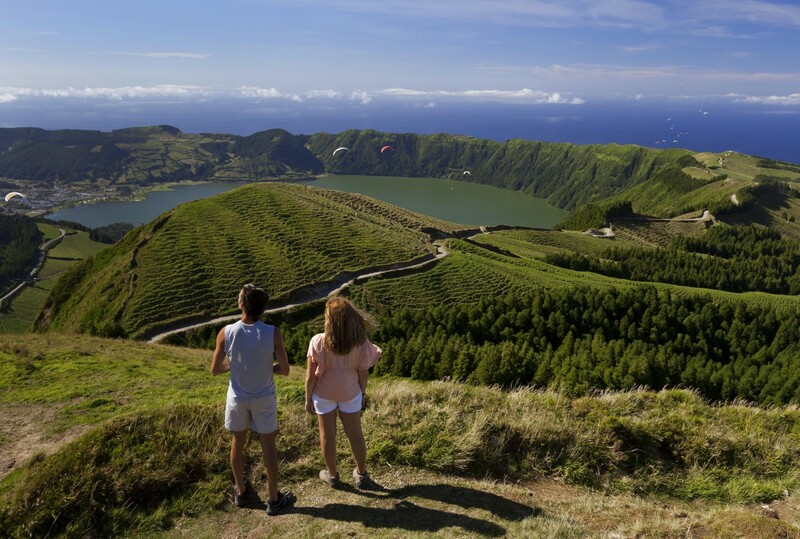 We invite you to enjoy nature at its best in Lagoa do Fogo’s natural reserve. Tonight dinner will be at the famous art deco restaurant of the hotel. 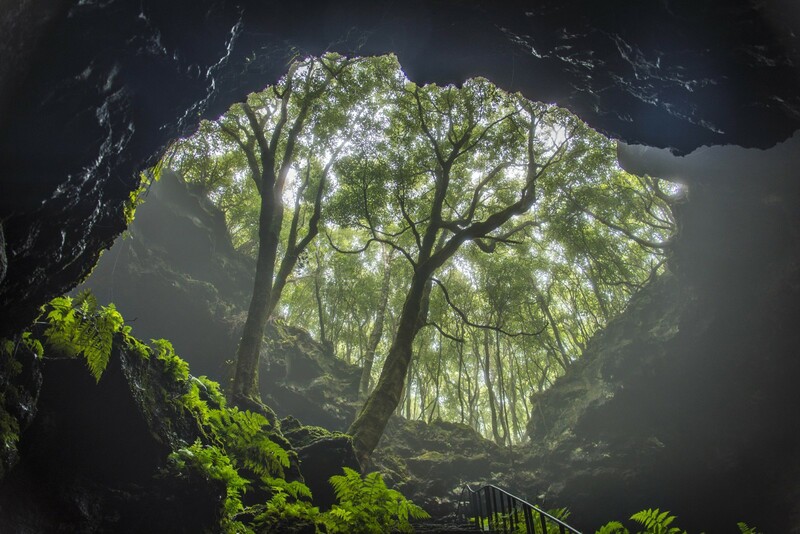 On today’s tour you will feel and experience the volcanic origins of the Island in Furnas, a magical place. In the morning we will depart on an easygoing walk through the village. We will buy all the items in the local market that we need to cook dinner. Then we will be transferred to the lake and for a short hike along the shore. After circling the lake and discovering the abundance of endemic plants, the group will stop at Caldeiras da Lagoa das Furnas (Furnas Lake Calderas), a place where we cook the famous “cozido das Furnas”. Here we have a cooking class with the ingredients purchased at the market. You may think to yourself: ‘Dinner in the morning? Intriguing!’ We will prepare the special “cozido meal” which will cook underground for 6 hours using only the steam of the Earth. 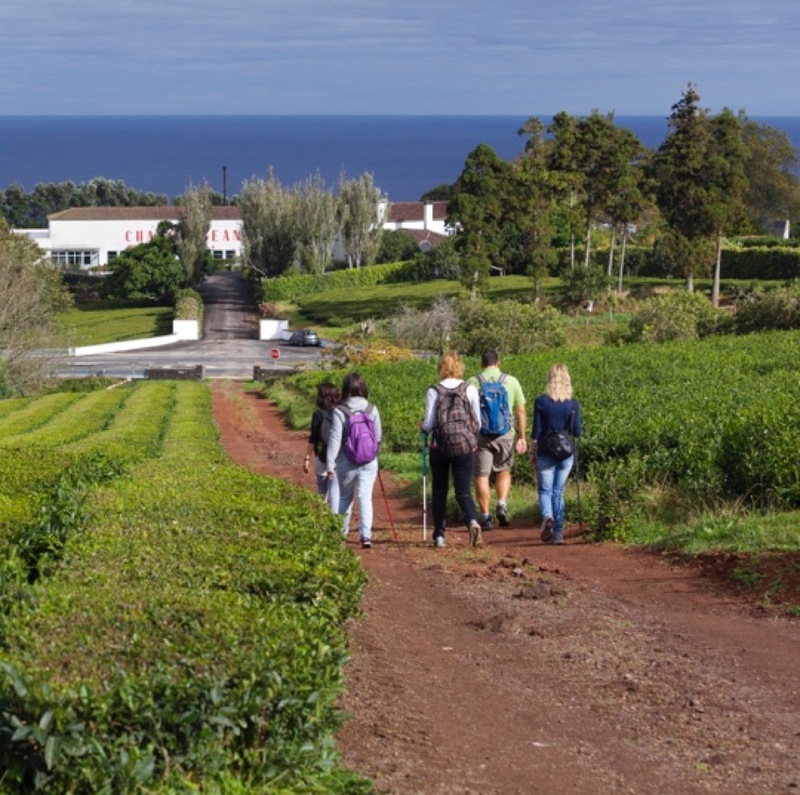 While dinner is in the oven we will have a picnic lunch and then you will be transferred to Faial da Terra for a 2.5h hiking tour in the interior of the island. Our walk starts on a steep narrow road that leads us to Sanguinho – a village that has been abandoned since the early 70’s that is now in the midst of a restoration. The remainder of the trail is through the woods, with short up and down hill stretches between very dense and beautiful vegetation: this is a walk in which you can “smell” all the lush vegetation around you! Upon reaching Salto do Prego’s waterfall, we have time for refreshments while enjoying the beautiful waterfall in front of us. Before dinner you’ll have some free time to dip in the amazing tank of ironized hot water in the hotel’s botanical garden, before getting ready for our evening. Your dinner will be served at the hotel in the beautiful art-deco restaurant, with views of the iconic botanical park. Depart the Azores – Até à vista! Along with your guide and driver, you will start the day with a visit to the only tea plantation in Europe. You will be able to visit the working tea factory and have a lovely break to taste the locally produced tea. During the morning you will have some free time in Ponta Delgada for shopping. Lunch at 12.00pm. Transfer to the airport. It’s now time to say goodbye… Até à vista! Hotel Azor, opened in May 2016, is a luxurious, vibrant and cosmopolitan hotel located in the heart of Ponta Delgada, right next to the marina. Rooms offer stunning views of the sea, and are equipped with all the modern amenities, like air conditioning, soundproofing, a minibar and a flat-screen cable TV. Free WiFi is available throughout the property. In the evening guests may relax at the on-site bar. Boasting panoramic views of the Atlantic, Baía da Barca is tucked away in a quiet bay, and provides guests with a great base during their stay on Pico Island. Striking architecture, stylish decor, and a comfortable atmosphere awaits guests. The hotel features an outdoor pool, sauna and hot tub for your convenience. Terra Nostra Hotel, in the heart of São Miguel Island, has won many international accolades. Located in Furnas Valley, its 18th century Terra Nostra Garden exudes a breathtaking atmosphere of exoticism in perfect harmony with nature. The hotel’s interior design concept stems from the Art Deco style, and introduces contemporary elements and materials, creating comfort and exclusivity perfectly integrated with the lush Terra Nostra Garden. You will have an unforgettable wellness experience, leaving you with memories to last a lifetime.